OK, this is not for the week at heart, I mean toddlers are part octopus combined with the grace of a rhino. However if you think of it as a game of ispy, and let’s be honest looking at art is kind of like that, you will already be able to start enjoying the whole experience. Lower your expectations to all having a successful experience to hands to yourself and walking feet– you will leave with some sanity remaining. Say Cheese! (iphone photo time to prove that yes he like the art!) He saw this room filled with flowers and said “Mama.” Yes, I love flowers! I, as I typically do, all the sudden realized that the Tom Wesselmann exhibition was closing and I hadn’t seen. So I made the last minute decision to take the toddler, after swim lesson of course because that totally makes sense. I didn’t prep him much head of time other than before we walked inside I explained that he would hold my hand and he would not touch anything. Here is what I learned- they do like looking at art- it is like looking at pictures in a book that instead of turning the page, you get to walk to the next page- and in the case of the VMFA, the elevator is really really cool! Make sure they have eaten, and are rested. Keep it short- and by short I mean 30 minutes at the most, and I would say start with the expectation of 15 minutes. However, if they get engaged, then you can lengthen this. Let them take the lead on where to go and explore, but do have them hold your hand if they want to walk. If walking, I recommend making a huge deal out of a ticket or a map so they will carry this in the other hand. I mean I acted like the ticket into the Tom Wesselmann exhibition was the most prized possession in the world. Busy hands can’t touch anything! If walking, have them put one hand in their pocket and then with the other hand hold your hand (we do this in stores as well). If not holding hands, teach them to clasp their hands together either in front or behind them. Point out the paintings and say what you see. Act totally excited about what someone has create and made. Relate this to things your tot has create- for example, when your tot painted at the art easel. Ask them to spy what they see and tell you. Or if they aren’t talking much yet, say what you see and then have them find it. Find out if you can bring a strollers or backpack. The VMFA, allows for front baby carriers and strollers, but you can not carry anything on your back. What did my toddler like see at the museum? Well, he loved the space, the stairs and the elevator. He loved the changing textures of the floors, and the glass that you can view down below. So yup, his favorite thing inside the museum was not the art, but the space. But he did enjoy the process of looking for 5 minutes. For 5 WHOLE minutes, I looked like the best toddler mama ever with an art loving kiddo. And let’s remember that five minutes instead of the melt down when we were getting lunch because he wanted a cookie for lunch (WHO DOESN”T KIDDO, who doesn’t). Animals: horses are very popular at the VMFA, there are also a lot of farm animal sculptures such as sheep, bulls, and so on. Other things you can talk about while you observe things: the artist name, and the medium. Need to eat when you visit the VMFA? They have a nice cafe, and you can eat outside. The outside space is amazing. It is restful even with a toddler, OK well restful is relative but it has a very nice few, much better than the one at Chick-fil-a. 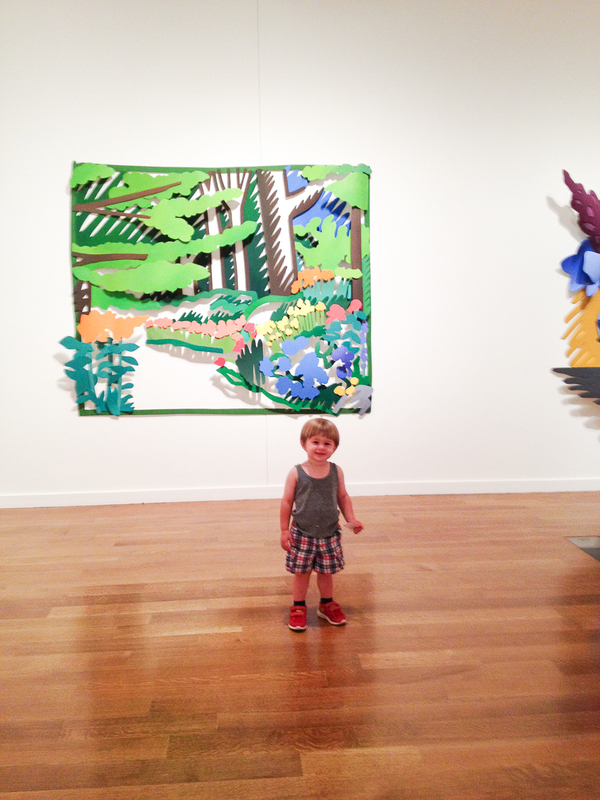 Don’t forget the outside space at the VMFA – it is amazing and perfect for toddlers. There are stairs, there is water, there are hills, there is grass. It is a very nice space to climb and explore. 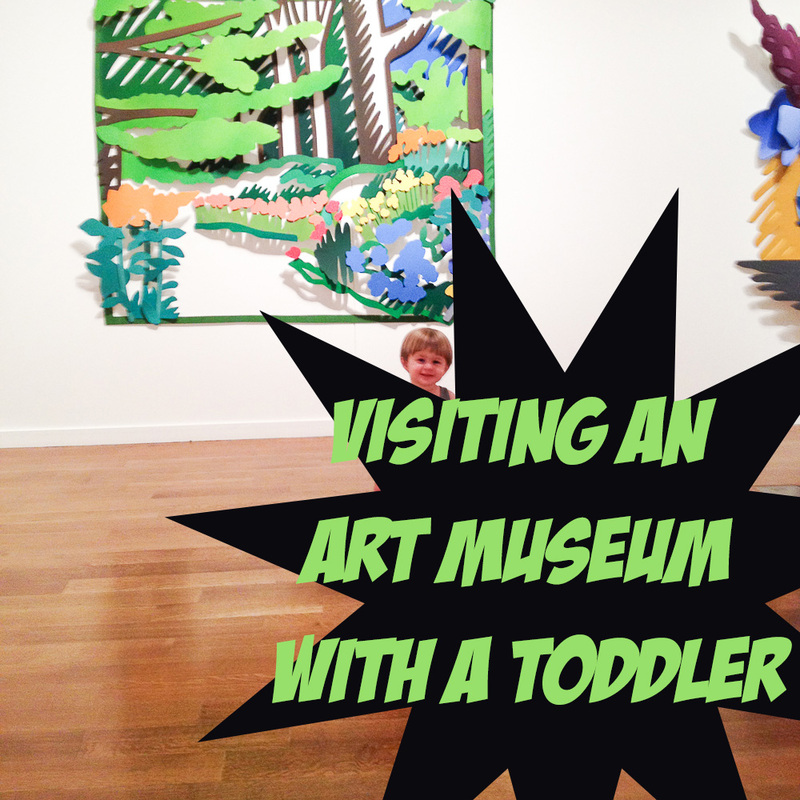 Share your experiences with art museums and toddlers.